Another way to enjoy and celebrate Baltimore’s finest beer. Hi, my name is Gwynne. I have been making jewelry all my life. My mom took me to my first jewelry class when I was at a very young age. I was home-schooled for several years and was always encouraged to be creative. I decided to focus on earrings because of my own desire for more exciting accessories. I found myself making earrings for specific outfits or creating outfits based around my newest creations. I love having the perfect pair of earrings for every occasion. My taste and style is ever changing because I am constantly inspired by my surroundings. The majority of my jewelry is made out of objects and recycled from clothes I don’t like or can’t be repaired or sold. So back to Natty Boh. I was given a bag of Natty Boh promotion key chains and told to make earrings out of them. That is exactly what I did, and it was a lot of fun. I make earrings out of all sorts of unusual things so things so this was not out of my comfort zone. I kept with the black and white theme. 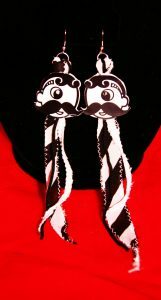 The Natty Boh heads are lightweight and made out of rubber. The key chains were meant for caping your key, to distinguish it or give it flare. 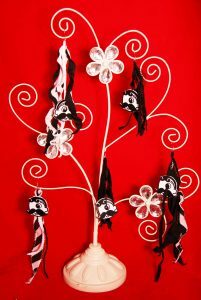 I like the look that the floating one-eyed iconic Natty guy hanging from such a delicate feminine object such as a long dangly earring. 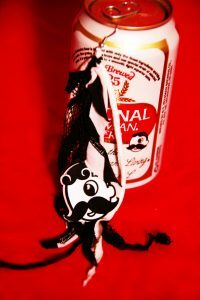 I hope you enjoy these I just had to share them with other Natty Boh fans. I made this jewelry set for some ones wife because they both love the little riddles on the inside of the caps. For a little history on National Bohemian, Baltimore’s signature beer click here!